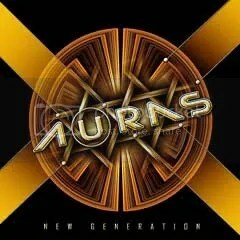 Auras is a fairly new AOR outfit from Brazil that doesn’t set out to reinvent the wheel with New Generation, their debut album. They follow the formula set forth by previous acts like Journey, Survivor and basically any other melodic rock group that was a part of (or was inspired by) the 1980s melodic rock scene. This isn’t necessarily a bad thing as “eighties” melodic rock can be a pleasure (or a guilty pleasure at least) to listen to. What really sets the band apart is their vocalist Gui Oliver. Most AOR singers generally sound good. Hey, you better sound “good” when Steve Perry is what you’re shooting for but Oliver really does stand out as one of the best that I’ve heard recently. Though there are similarities he’s not a Steve Perry-clone but he’s in that same mold where you could probably give this guy any series of notes to jump through and he could do it. My favorite track is the uplifting “Never Give Up”, which is Journey worship but is still a great catchy and positive tune. If you’re familiar with Frontiers Records releases, you know what to expect from the label’s output and Auras’ New Generation doesn’t do much to challenge listeners or break the mold but it is a still a decent slice of melodic rock with a number of bright spots. It’s a fine debut that shows potential for this band to do even greater things in the future.